Despite big gains in August, GreenSky traded down roughly 11% from its $23 IPO price. GreenSky, Inc. (NASDAQ:GSKY) stock rose 17.1% in August, according to data provided by S&P Global Market Intelligence. The online financing company's share price climbed following news that it was partnering with American Express, sold off after the company's earnings release on Aug. 7, and then seems to have regained ground thanks to favorable ratings coverage. GreenSky allows businesses (such as home-improvement specialists or medical professionals) to set up customers seeking financing with regional banks and then collects fees from the successful establishment of loans. Last month marked the company's first quarterly report since going public in May. The multi-faceted collaboration will enable eligible U.S. merchants within the American Express network and the customers they serve to access GreenSky's proprietary point-of-sale financing solutions. Using GreenSky's platform and technology, home improvement and elective healthcare merchants that accept American Express will be able to drive incremental sales by providing qualifying customers with options to finance large purchases in a paperless environment. Customers apply for installment loan financing via GreenSky's mobile app, online or over the phone, and typically receive a decision and transact within 60 seconds. GreenSky will also have access to American Express vPayment, a virtual payments solution, in order to facilitate purchases via virtual account numbers delivered to approved customers. The partnership has the potential to rapidly expand GreenSky's merchant count, but the stock sold off following the company's debut quarterly report. Sales for the quarter ended in June were up roughly 28% to reach $105.7 million, coming in just ahead of the average analyst estimate's call for revenue for $105.2 million. Transaction volume conducted through the company's platform increased 36% compared to the prior-year period to reach roughly $1.3 billion, and earnings per share of $0.18 beat the average analyst estimate by $0.02. Those are solid results, so it's not surprising that shares rebounded. 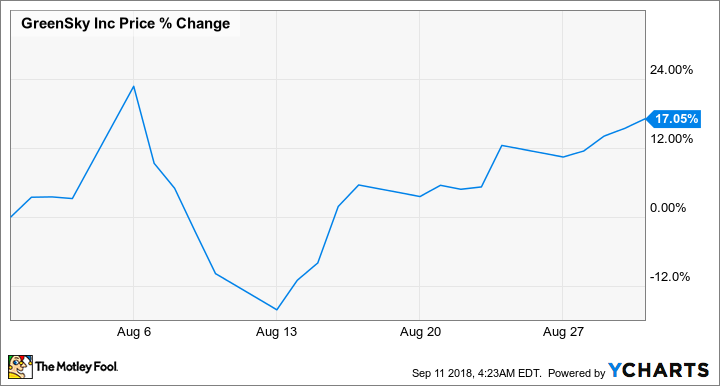 Its share price also appears to have benefited from favorable ratings coverage published by Cowen on Aug. 16, which raised the firm's rating on the stock from neutral to buy CompassPoint also raised its rating from neutral to buy and put a $27 price target on the stock. The company managed to increase its merchant partner count by 45% last quarter, but with just 13,440 partners at the end of June, there's still huge room for growth. Deals like the one it signed with American Express could help it continue to grow its merchant count at a rapid clip. For the full year, the company expects that transaction volume will increase between 38% and 41% to reach roughly $5.2 billion at the midpoint, sales will be up between 34% and 37%, and for adjusted earnings per share to come in between $0.64 and $0.66. If the company were to hit the midpoint of its earnings target, shares would be trading at roughly 31 times the year's earnings, which looks like an attractive valuation in light of the remaining growth potential. GreenSky isn't a low-risk investment and there's not a lot of data to map how its business will progress, but it could be a worthwhile play for growth-focused investors.